The Big Three networks all recognized the 50th anniversary of John Glenn's historic orbital spaceflight on their evening newscasts on Monday. Both NBC and CBS highlighted how there's "no certainty when the U.S. will launch astronauts again, [and] Glenn worries America may be losing its edge." But the networks failed to mention that President Obama put the decades-old endeavor in limbo, which led to the unemployment of thousands of technicians. Brian Williams concluded his report on NBC Nightly News by noting how "it irks Senator Glenn that the manned space program is now idle. The Shuttle program is over, and the only ride available into space for American astronauts is the Russians, the former enemy that [he] was chasing into space 50 years ago today." ABC's "This Week" began its Independence Day weekend program with a segment that echoed Time magazine's cover story questioning whether the Constitution matters anymore. ABC and NBC have delivered fawning coverage of First Lady Michelle Obama's visit this week to South Africa and Botswana, oozing over the "celebrity" and "excitement" of the "patented Michelle power" on display. To its credit, CBS has largely taken a pass on the idolatry. As NewsBusters previously reported, ABC's "This Week" invited on a number of Tea Party Congressman Sunday to discuss the budget debate going on in Washington. Think of it like an ATM pin number to get your money, except that when Bill Clinton was President, someone lost the biscuit. This is according to the former chairman of the Joint Chiefs, Hugh Shelton, who’s just come out with a memoir, and it’s right there on page 392. "At one point during the Clinton administration, the codes were actually missing. That's a big deal," Shelton writes, "a gargantuan deal." Especially, he says, because the codes were unaccounted for for months. A clip of Lieutenant Colonel Patterson was shown recounting: "[President Clinton] thought he had misplaced them upstairs. We called upstairs, we started a White House, kind of a pretty thorough search around the White House for the codes, and he finally confessed hours later that he, in fact, misplaced them. He couldn't recall when he had last seen them." After showing completely manipulated scenes of wolves and whales, of rented, captive animals being portrayed as wild, Donvan spun, "Some argue that using captive animals actually spares truly wild animals the trauma, disruption and danger that comes with human contact." The ABC correspondent interviewed Chris Palmer, a whistle blower who worked on several of these documentaries and exposed the fraud in his new book Shooting the Wild. Yet, Palmer, who is an environmental professor at American University, excused the practice: "I think you could make the argument that this is okay, because the film is going to do a lot of good...Maybe it's worth it to have told the lie." ABC’s "Nightline" on Thursday celebrated Sonia Sotomayor’s confirmation to the Supreme Court as a "Jackie Robinson moment" and also highlighted cheering crowds at an event put on by the left-wing Puerto Rican Legal Defense Fund (PRLDF). Correspondent John Donvan failed to identify the liberal bent of the organization, which has vociferously lobbied for abortion rights, though he did note that Sotomayor served on the group’s board. In addition to comparing Sotomayor’s confirmation to Jackie Robinson’s entry into baseball, Donvan actually brought on Democratic operative-turned-ABC journalist George Stephanopoulos to reference what it was like for Greek Americans when Michael Dukakis ran for President in 1988. Stephanopoulos enthused, "There was something that trumped the politics, the partisanship. I knew a lot of Republican Greeks who were supporting a Democrat for first time just because he was one of them." Donvan described the Greek American Stephanopoulos as "somebody who should know" what it felt like. But he failed to specifically mention that the ABC host also worked for the Dukakis campaign at the time. Earlier in the piece, Donvan raved, "And while this is definitely a Latino thing, it is also, we should say, an American thing....Call it a Jackie Robinson moment, to borrow a lesson from sports." One sign the liberal news media live in a plastic Manhattan bubble is their undying ardor for the Kennedy Myth, best known by that public-relations construct "Camelot." Instead of a president and First Lady, they believe, we had the King and Queen of Glamour. Never mind if their marriage was a joke and his list of presidential accomplishments was short. Never mind if the Republican half of the country feels sickened by the obsession. The media preferred the myth – and they still do to this day. 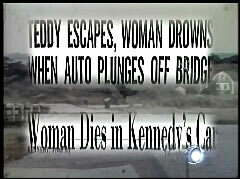 It is why they are promoting the anointment of unaccomplished Caroline Kennedy for the U.S. Senate in New York. The very same media which spent months dismissing former mayor and Gov. Sarah Palin as too inexperienced for national office is now championing a woman whose primary qualification – her only qualification -- is her last name. The very same media which still mock Palin’s folksy "you betcha" or her interview with Katie Couric don’t seem to notice when John Fund reports that in one 30-minute interview on the cable news channel New York One, Caroline Kennedy used the slang "you know" a total of 168 times. How will Caroline Kennedy be expected to cast votes in the Senate when she’s cared so little about voting as a citizen? Faced with reports that she had missed voting in several New York elections, including the 1994 re-election effort of Sen. Daniel Moynihan (the Senate seat she now expects to be handed like royalty), Kennedy told the Associated Press "I was really surprised and dismayed by my voting record. I'm glad it's been brought to my attention." "Nightline" anchor Cynthia McFadden and ABC reporter John Donvan on Monday gushed over the possibility that Caroline Kennedy could replace Hillary Clinton as the senator from New York. McFadden (see file photo at right) teased the segment by cooing, "So, is another chapter in the Camelot story about to be written?" Donvan repeatedly mentioned that Caroline Kennedy wouldn't have much experience for such a post. But, he didn't seem bothered at all by this, at one point stating, "All she will have at first is that name. But, at least she has kept it the way it was remembered, as part of a story that so many wanted to believe in." Contrast this with the coverage vice presidential candidate Sarah Palin received over a perceived lack of experience. Certainly, the media were not as forgiving for a non-Kennedy such as the governor of Alaska. Donvan contributed the requisite vapid reminiscing of the Kennedy years. The ABC journalist described Washington D.C. as a place "where, when her dad was the president, we first came to know the little girl, riding his shoulders, saddled up on ponies." Mother knows best? Or journalist does? ABC's "Nightline" seems to think so when it comes to nutrition advice. The May 8 broadcast featured health tips from a writer with no scientific background encouraging viewers to only eat food their mother would recognize. Michael Pollan, a long-time opponent of "agribusiness" - the food industry - was featured in a segment on his new book, "In Defense of Food: And Eater's Manifesto." Pollan advocates a return to an all-organic diet and offers tips for healthy eating. Pollan praised "the authority of mom" and lamented that "the holders of culture when it comes to food (mothers) have been undermined by both the scientists and the food marketers."